I have not managed to write as often this summer as I would’ve liked but not because I have been idle. While my friends have been traveling in Europe and what not, I have spent the entire time within a twenty minute walking radius of my campus apartment. This is not as depressing as it sounds. I got a lot of math done and read some very interesting books. 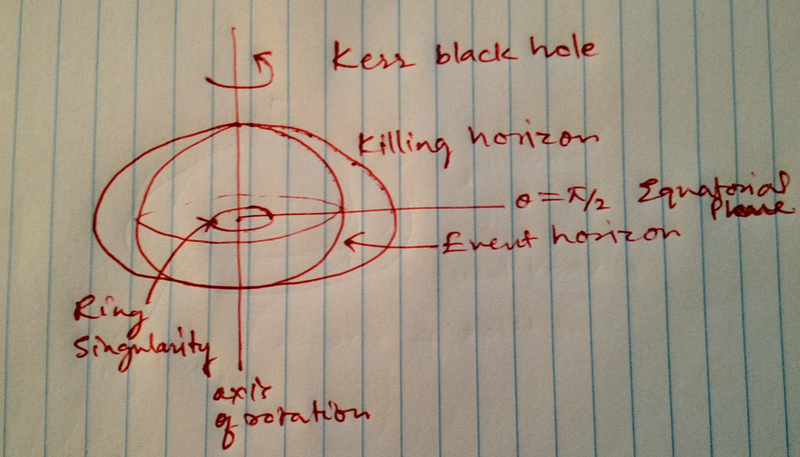 Regular readers may recall that I work in black hole geometries. 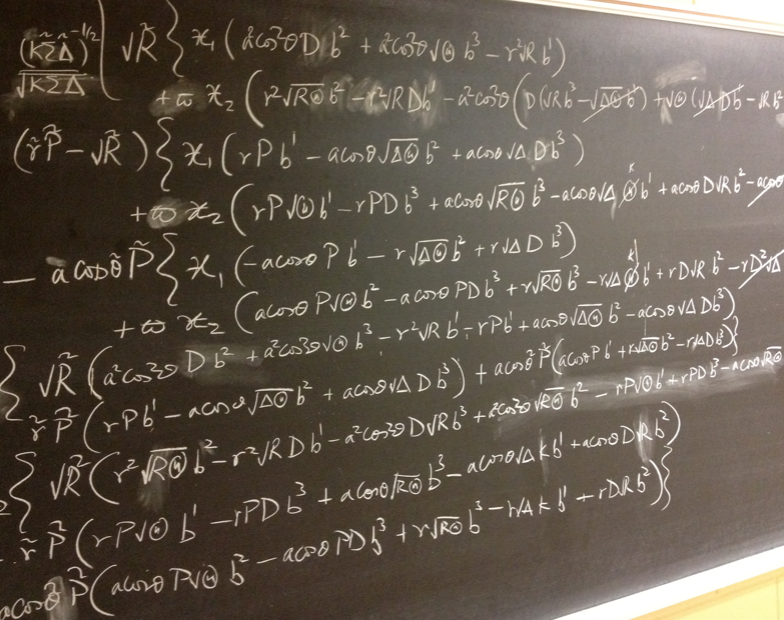 These are highly symmetrical solutions to Einstein’s field equations. At first, these were regarded as curiosities but now we have evidence of hundreds of black holes. The current consensus is that there is a supermassive black hole at the center of very galaxy, of which there are billions in the observable universe alone. A recent development has been the visual detection of a black hole swallowing a red giant. The no hair theorem guarantees that a black hole located at the origin in a flat Minkowski background, is completely characterized by 3 parameters: mass (M), angular momentum (a), and electric charge (e). The basic case is Schwarzschild geometry, which is a non-rotating black-hole without charge: a=e=0. This is just a special case of Kerr geometry, the more realistic rotating case, which is itself a special case of Kerr-Newman geometry: a charged, rotating black hole. As it turns out, this last generalization is trivial to handle: one adjusts the function by adding the magnetic and electric monopole moments and the expressions look exactly the same otherwise. Therefore, there is no loss of generality in working in Kerr geometry. A Schwarzschild black hole is algebraically simple to handle but a bit boring. The metric in this case is diagonal which means what manipulating tensors and other quantities that live on this geometry is relatively straight forward. It has a singularity located at the center and an event horizon at r=2M. No particle–not even a photon–can escape once it passes through the event horizon, which is why it’s called a black hole. This solution is spherically symmetric, which means that one can work on the equatorial plane without loss of generality. On the other hand, the more physical Kerr solution has a very interesting structure. 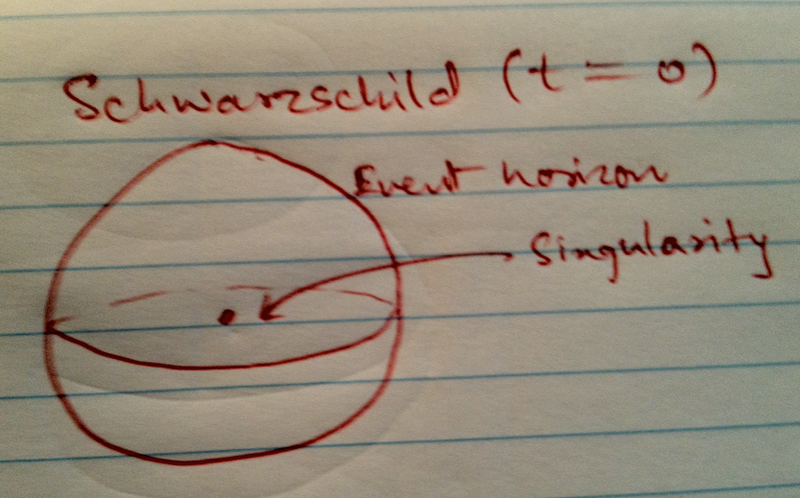 Instead of a point singularity like Schwarzschild, it has a ring singularity. Imagine cutting out a circle from a plane. And instead of a single horizon, there are two: the event horizon and the Killing horizon. 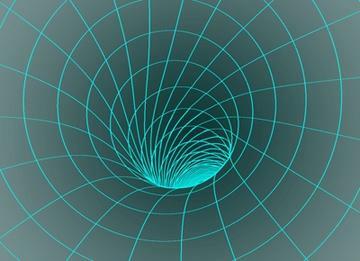 The event horizon is the hypersurface of infinite red-shift, just like the Schwarzschild case. The Killing horizon is an oblate hypersurface that touches the event horizon at the poles but extends out towards the equator. The region between these two horizons is called the ergoregion. Strange things happen here. In the ergoregion, the vector becomes spacelike and it is that is timelike. This means that it is r that measures time inside the Killing horizon. Moreover, frame dragging in this region is extremal: you have to co-rotate with the black hole, it takes infinite energy to counter-rotate. Note that Kerr geometry is only axisymmetric. The axis of symmetry is the axis around which the black hole is rotating. An additional symmetry is flipping the black hole like an omelette that leaves the equatorial plane fixed, effected though the coordinate change that sends leaving the same. Reducing to this plane of symmetry is not without loss of generality. A basic question is what happens to a photon as it propagates in the vicinity of a black hole. Indeed, knowing the history of every single light ray we basically know the entire “history” of the spacetime. But apart from the orbit of a photon we are also interested in its internal degrees of freedom. This is the phenomena of spin. Photons are spin-1 particles. This means that there is just a circle’s worth of freedom once we have specified the 4-momenta. This has to do with the representation theory of the Lorentz group, the group of local isometries of any spacetime. In fact, every particle–all particles of the same kind being absolutely identical–corresponds to a distinct irreducible representation of this group. A representation is a map from the group to a vector space . If the group law is ab=c, then , so the action maps the group structure onto V. Irreducible representations are the ones that cannot be decomposed into a direct sum of other representations. Whence, they are the fundamental building blocks of the group structure. The connection to fundamental particles goes very deep and lies at the heart of quantum field theory. But I digress. The polarization of a photon is given by a vector ƒ that is orthogonal to the photon 4-momentum k. One needs a transport law to figure out what happens to this vector as the photon propagates. This transport law is given by parallel propagation. 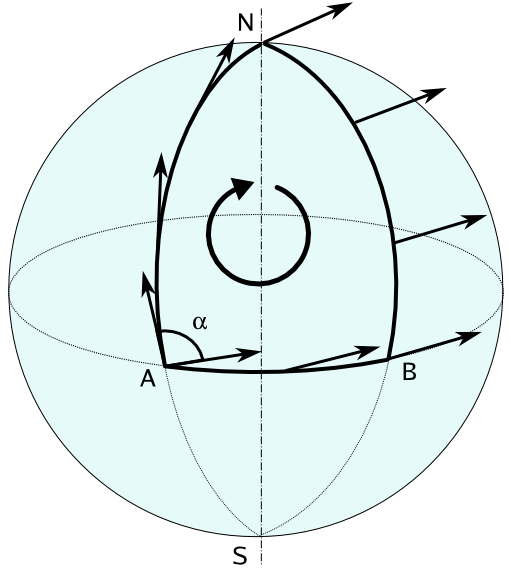 One can then compare the polarization vector at two events (as seen by observers there), and calculate the Faraday rotation, which is the rotation of the polarization vector induced by the curvature of spacetime. Here is the covariant derivative operator, which is just regular derivatives plus correction terms for the curvature of spacetime . Now, these equations are straight forward to solve in Minkowski spacetime and even Schwarzschild, but a nightmare in Kerr geometry. So much so in fact that it has only been done in the weak field limit, i.e., far from the black hole. My work this summer has been focused on figuring out how to do this in the general case, in terms of what observers actually see. 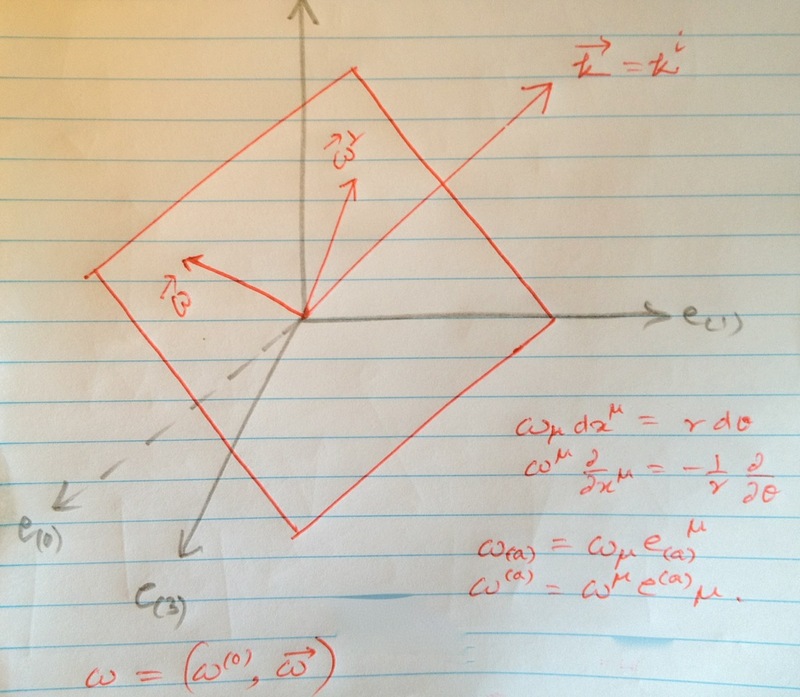 This has taken me into deep hidden symmetries of Kerr geometry captured by Killing-Yano theory. That is some non-trivial math and I won’t go into that, but I have managed to obtain a very simple proof of the following proposition which I can elaborate here. Consider a photon and an observer confined to the plane of symmetry in the Kerr exterior. Such an observer will not detect any Faraday rotation. 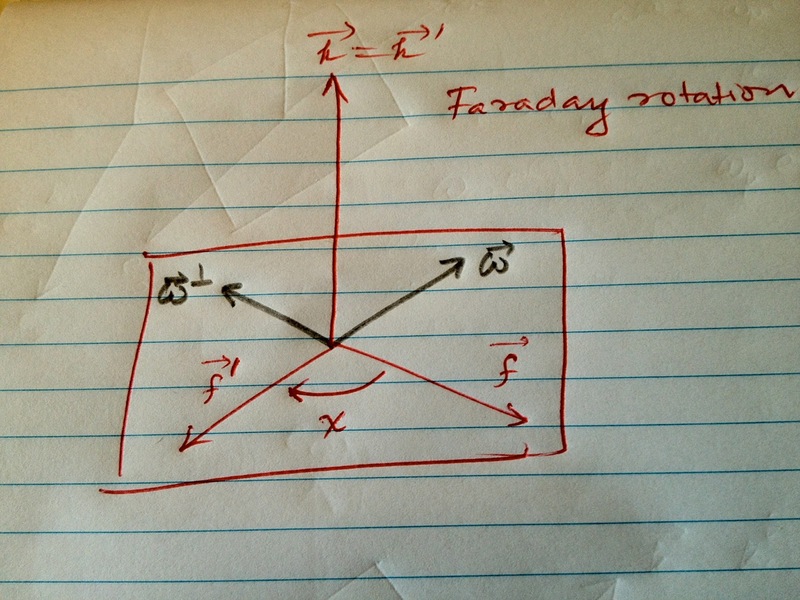 Of course, this being differential geometry, I had to calculate multiple cases and get frustrated about finding zero Faraday rotation on the equatorial plane for a month before attempting to prove the proposition. The proof turned out to be surprisingly simple. What took months of hard slogging was being able to imagine that such a proposition could hold. There was no a priori reason to suppose that this physically measurable effect would vanish on the plane of symmetry. One suspects that this is true of any sub-manifold which is a spacetime in its own right. That is, a totally geodesic sub-manifold. Being the set of fixed points of the discrete symmetry , the equatorial plane is guaranteed to be totally geodesic. This is also the case for the axis of rotation . I hope you enjoyed reading that. If something is unclear, by all means shoot me a comment. I am in the middle of Kindleberger’s classic Manias, Panics, and Crashes. Perhaps I will write a review of that along with a few others I have read recently. Spacelike: A vector pointing in the spatial direction as seen by an observer, one that points to events that cannot even be reached at the speed of light. Timelike: A vector tangent to a curve appropriate to a massive particle, one that points to events that can be reached at subluminal speeds. Frame dragging: Observers carry orthonormal frames with them. In curved spacetimes, these axes get distorted because of the differential between the gravitational force at nearby points. For instance, the gravitational force on your feet when you are standing up is marginally greater than that felt on your head. In the vicinity of a black hole, such effects become extreme. Evyerthing is unclear! But that is only because I have only the vaguest clue what you are talking about. I really wouldn’t worry about trying to rectify this situation. Perhaps I should explain parallel propagation? Let me try to add a glossary at the bottom. Maybe that’ll help. Don’t apologize. There no need to. I vaguely recall a few things from our last conversation. The glossary was very helpful. Once I have a place to stand, i.e. a frame of reference like spatial and temporal axis, things start to make a whole lot more sense. be familiar with afterward you can write if not it is difficult to write. I am truly glad to glance at this blog posts which consists of lots of useful facts, thanks for providing such data.